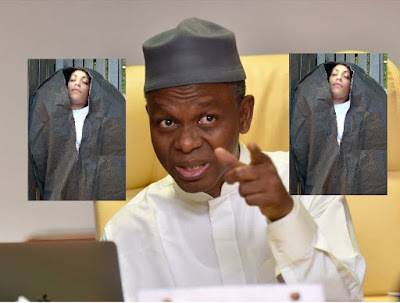 The Kaduna State Islamic Fundamentalist Governor, Malam Nasiru El-Rufai, under the backing of APC led federal government of Nigeria, has with impunity, openly threatened to kill foreign observers who fail to comply with the orders guiding the forthcoming general elections in the country. The governor made it emphatically clear that all election observers that will contravene guiding laws in the election update reportage, according to international best standards will be sent back to their respective countries in body bags. This is the height of international threat coming from the Islamic government of Nigeria in recent times. The Nigerian government in it's desperation, is doing everything humanly possible to scare foreign observers away from coming to monitor the elections according to globally spelt out legal requirements. However, the international community shares in the blame of this murderous threat coming from a Nigerian government principal officer. The brazen cynical docility of the United Nations, European Union, governments of the United States of America, Germany, France, United Kingdom, Russia and Israel, over the senseless/relentless killings of unarmed/peaceful Biafran agitators by the Nigerian government, serves as the propelling force behind such a threat. The international community will most assuredly, descend into irredeemable infamy should the Nigerian government and one of it's frontline radical Islamic fundamentalists, governor Nasir El-Rufai of Kaduna State, get away with this disgusting callousness. It will definitely serve as a tacit approval for the Islamic government of Nigeria to unleash with reckless abandon, unprecedented level of violence and mayhem on foreign observers during the elections particularly and thereafter, on Biafrans in general. The Nigerian government has wittingly and unabatedly committed heinous atrocities against the Biafran people but the world kept looking the other way. This docile stance has emboldened the government to put up plans of killing foreign observers coming to monitor the 16th February 2019 presidential election as scheduled because they firmly believe that the global community lacks the clout to raise incriminating questions in the event of any misnomer. It is time therefore, for the concerned global players to take drastic, pre-emptive measures to arrest whatever shade of impunity the Nigerian government would want to employ in carrying out acts of lawlessness in the country.